RUTLAND—The Cobra Gymnastics Team competitive season is in full swing. Young, local gymnasts from around the Rutland region have been busy the past few weeks traveling around Vermont, and to Massachusetts and New York for competitions. The Cobra Gymnastics team has two distinct competitive tracks: The Xcel Program and Junior Olympic Compulsory program. The Xcel Program and is slated for gymnasts who are multi-sport athletes. It allows them to train less, but still compete in gymnastics. The Junior Olympic Compulsory program (levels 3-5) on the other hand, offers a more intense program focusing on choreography and improving scores. It prepares the girls for the higher Optional Levels (levels 6-10). The Xcel Bronze and Silver teams competed in the Candyland Invitational on Dec. 4 at Le Studio Gymnastics in Brattleboro, Vt., while the level 6 and 7 Optional team competed at the Thompson’s Holiday Invitational in Holyoke, Mass. The level 3s and 4s competed in their first Sectional Meet in Essex on Dec. 11, giving them their first opportunity to qualify for the Vermont State meet in March. Then, most recently, on Dec. 17-18, 21 gymnasts flipped and danced their way to great success at the World Class Invitational in Latham, N.Y.
Two gymnasts, Natasha Kopeck and Mia Marsh, were recognized with Judges’ awards for Floor Choreography at the Thompson’s Holiday Invitational. The level 6 team was also recognized at the World Class Invitational for a first place team finish on the Floor Exercise. 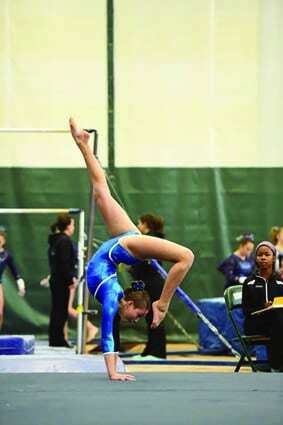 The next competition will be held Jan. 14-15 at Regal Gymnastics in Essex, Vt.
Natasha Kopeck, level 7, competes on floor.